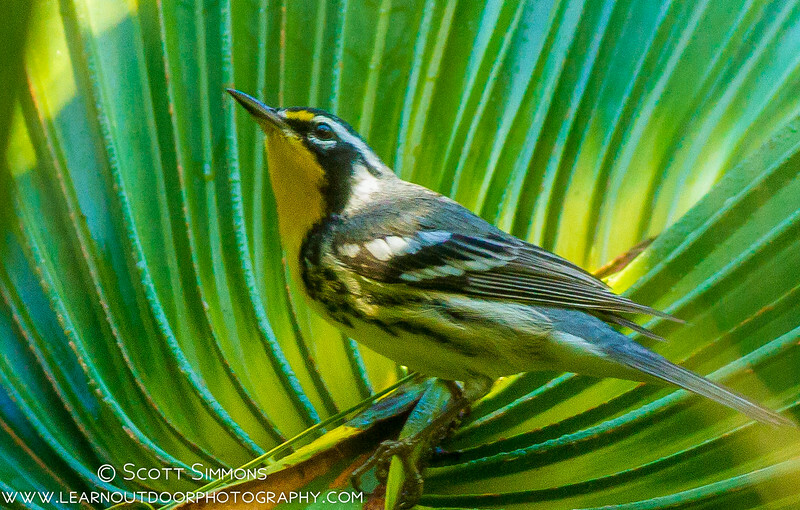 While they are one of our more common warblers here in Florida, I think they're also one of the prettiest. We see them throughout Spring and Fall migration, and a few can be seen during the summer and winter. 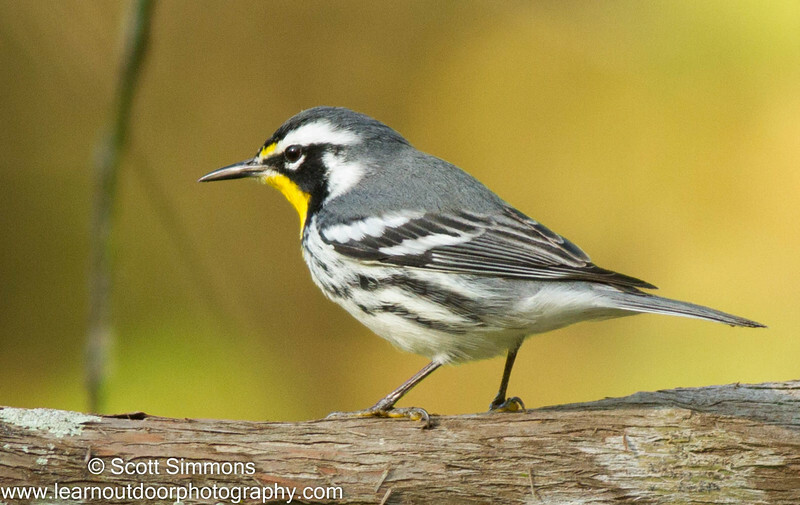 Most of our Yellow-throated Warblers have a little bit of yellow on front of their eyebrows or supercilium and long bills (dominica subspecies). Up north they prefer Loblolly pines on their northern breeding grounds, though when I see them here, I frequently see them in palm trees. But on rare occasions we see some with all white on their supercilium and shorter bills (albilora subspecies). They prefer breeding grounds among sycamore trees, but I haven't seen enough of them here in Florida to guess what they prefer as they pass through. 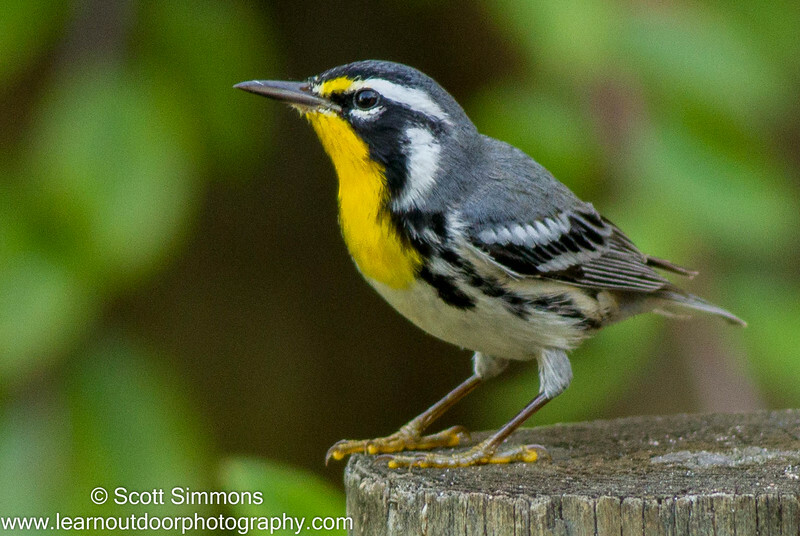 This time of year, Yellow-throated Warblers are pretty plentiful, and it can be tempting to dismiss them in search of rarer birds. But I still take an interest in these wonderful creatures, since it's always nice to see a white eyebrow among the yellow. I recently accompanied my husband on a business trip to Tremonton, Utah. While he attended to business, I gathered my binoculars and camera gear and visited Antelope Island State Park in Syracuse, Utah. I spent seven hours at this glorious park and excitingly tallied up 30 life bird species. Visitors to Antelope Island drive across a narrow, seven mile causeway from the mainland to the island. About three miles in, I spotted hundreds of shorebirds feeding in the shallow salt water pools. 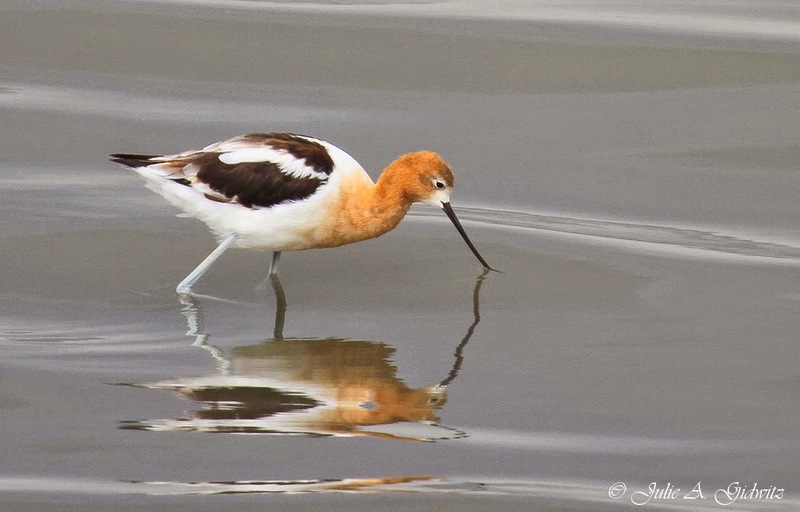 To my delight, as far as the eye could see, striking American Avocets were sweeping their thin, upturned bills back and forth just below the waters surface in search of nourishment. 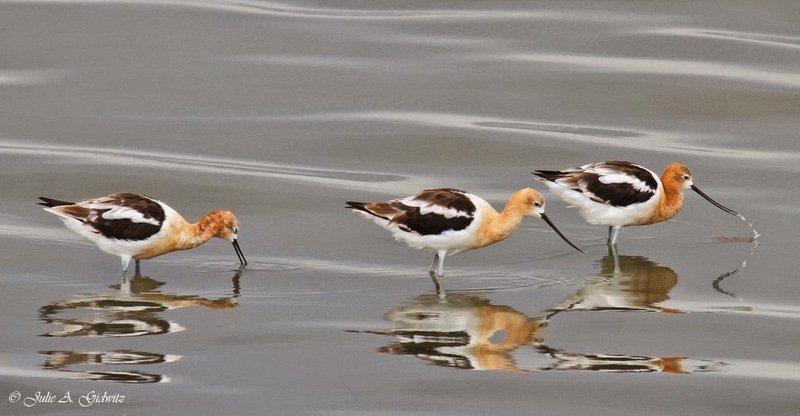 Avocets are not commonly seen in the Midwest, so viewing these beauties in such vast numbers was quite a thrill. 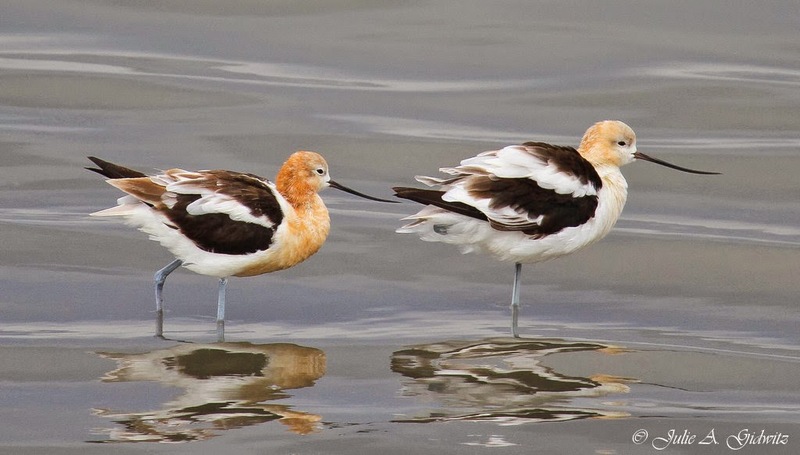 Last year, I drove an hour for my first ever sighting of two avocets seen at Fermilab in Batavia, Illinois. They were quite a distance away, but I was elated to catch a glimpse of these stunning birds. Imagine my glee in viewing such vast numbers of avocets along the Antelope Island causeway, at a much closer range. Though the weather was quite gray and dreary, I truly enjoyed observing these elegant birds. Birders are prone to proclaiming their favorite bird to be either the specimen of their most recent crushing sighting or the next expected bird on a big trip. Taking the latter route, I have to say Buff-breasted Sandpipers (Calidris subruficollis) are my favorite sandpiper and one of my favorite all-around birds. Buffies aren't particularly common migrants here in the Great Lakes, but they aren't particularly common anywhere. Their population hasn't been well studied, but it seems likely there are only 20,000 to 50,000 individuals on the planet today. Breeding on shorelines of the high arctic, they winter on the pampas of South America. That migratory route sends them through the Great Plains of North America where they frequent grassy fields, often invisibly. In these parts, we find them in...well, grassy fields (read: airports), but they're also regulars on some of our dry and pebbly beaches. 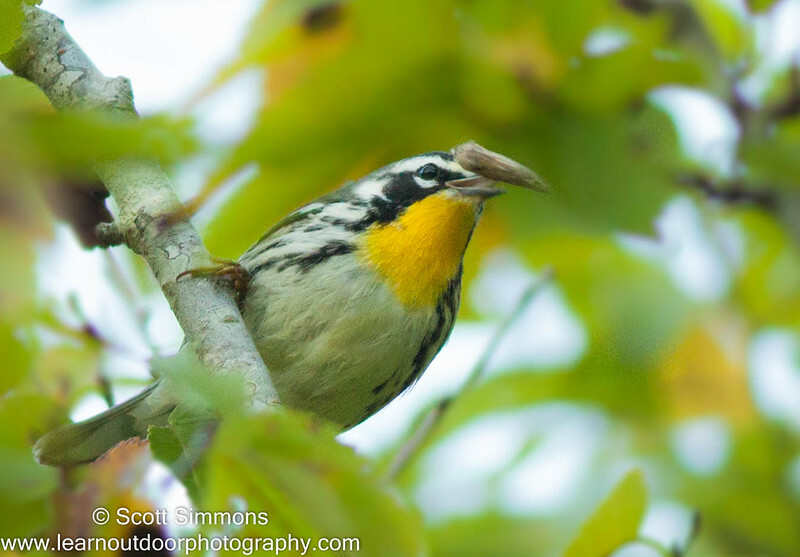 Buffies tend to use the same migratory stop-overs from year to year, so if you find some this fall it would be worth checking the same spot in the same week the next year. My lifer Buff-breasted Sandpipers were a pair I found at Whitefish Point on Lake Superior a few years ago. I was immediately smitten with their sharp look, nearly tame behavior, and soft buffy coloration that acted as remarkable camouflage on the famous sand-and-pebble beach at Whitefish Point. That tameness nearly got the species extinct a hundred years ago. Hunting impacted nearly all shorebirds, but Buff-breasted Sandpipers seemed to suffer worse than most. 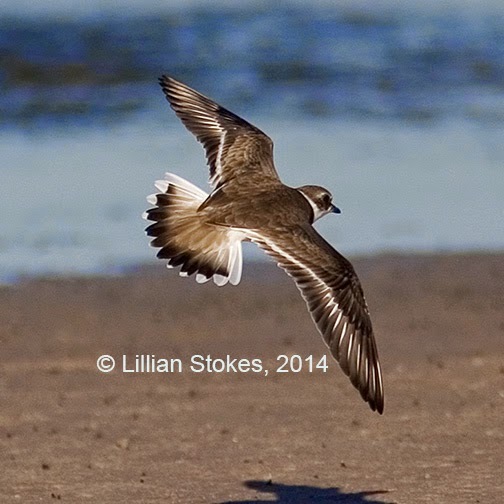 As far back as 1927, the ornithologist William Rowan, in describing the waders (the European term for what we in the Americas call shorebirds) of Alberta, attributed the near-demise of Calidris (then Tryngites) subruficollis to its tameness and tendency of individuals to stay with wounded flockmates. A hunter could blast a bird and take out a dozen more who stopped to check on the wounded bird. Millions of birds had been reduced to only a few thousand by the 1920's. The population has recovered, but may be declining again due to habitat loss on migratory route and wintering grounds, as well as climate change impacts on the breeding grounds. Buff-breasted Sandpipers are unique among North American shorebirds in showing true lekking behavior, though you'd have to travel extremely far north in May or June to see it. 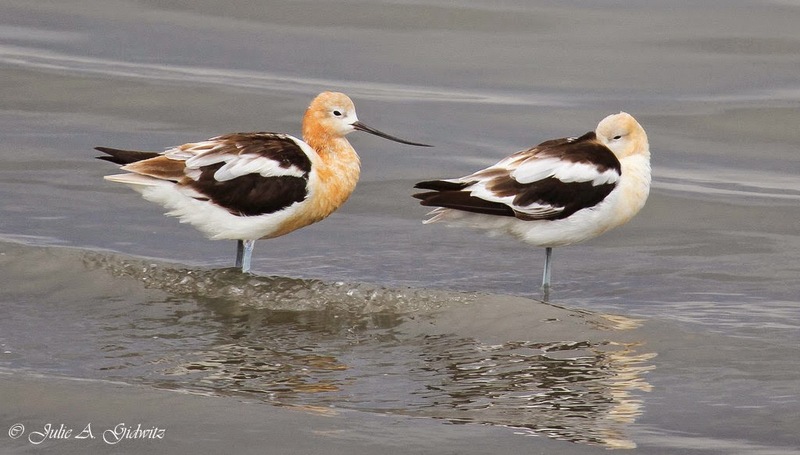 Great Snipe and Ruff in the old world are the only other shorebirds known to lek. Not being particularly showy birds, the lekking display of the male involves lots of jumping and wing flashing. Apparently showing off flashes of their pristine white underparts is what gets the females most excited. I really need to see a Buff-breasted lek some day. That just went on my birding bucket list. This past week I got what Frank Izaguirre would call my "lifelook" Buff-breasted Sandpiper. One had been showing off and on for more than a week at an unlikely location: the breakwall in the harbor of Marquette, Michigan. I happened to be in town and strolled out to see it. Buffies are more comfortable in fields and on beaches that aren't surrounded by deep water, but there was a colossal hatch of midges that had a lot of birds showing interest in the concrete breakwall. After getting a couple hundred meters onto the wall, not one, but TWO of these beautiful birds appeared and strutted around for a bit. After some good looks, they took off, flying far out onto the rocky portion of the wall. We birders turned around to return to shore and shortly came upon FIVE Buff-breasteds blocking our path. Unless the originally two stealthily doubled-back, there were now seven of the birds out there. At one point, one of them approached to within a meter of my feet. You can't ask for a better view than that. Several days later the winds turned to the north and Lake Superior unleashed her fury in a storm that sent waves right over the wall. I imagine by the time dawn arrived on that stormy morning my Buffies were on the move. Uruguay or bust! 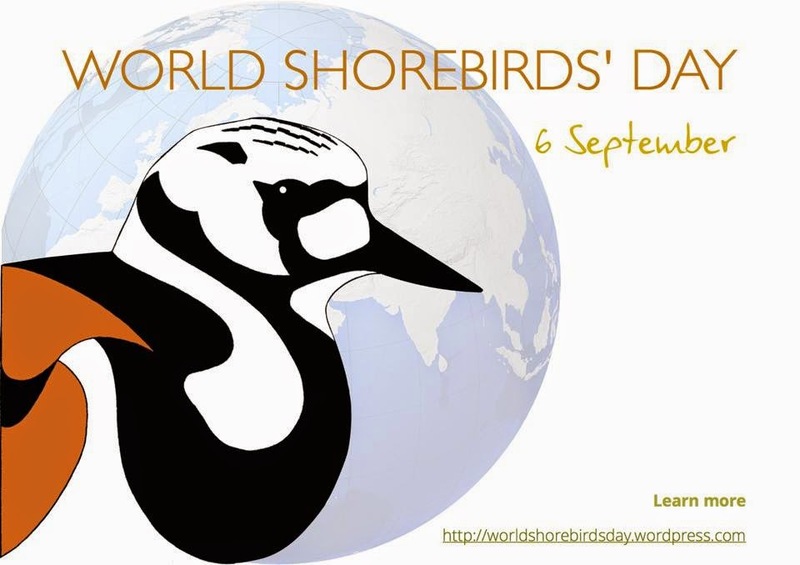 This weekend I am participating in World Shorebird's Day. From September 5-7th I will be out counting birds at four different sites in my area and submitting those counts to eBird. 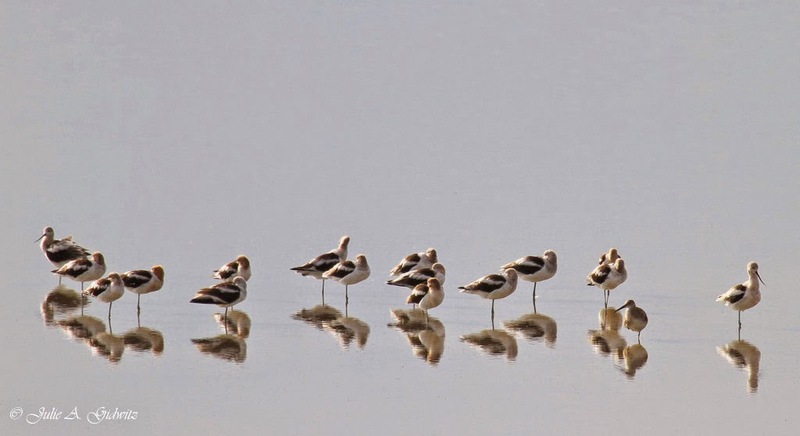 They will simultaneously go to the World Shorebird's database as well as scientist and citizens set out to document and appreciate shorebirds world wide. 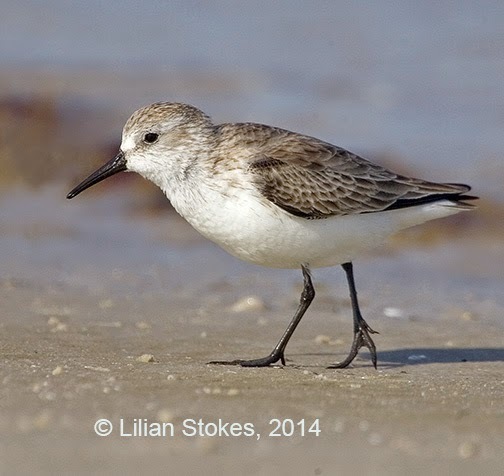 Many species of shorebirds are endangered due to loss of habitat and other environmental hazards. I want to do my part to help preserve these species so that others will be able to see and appreciate these amazing birds for years to come. 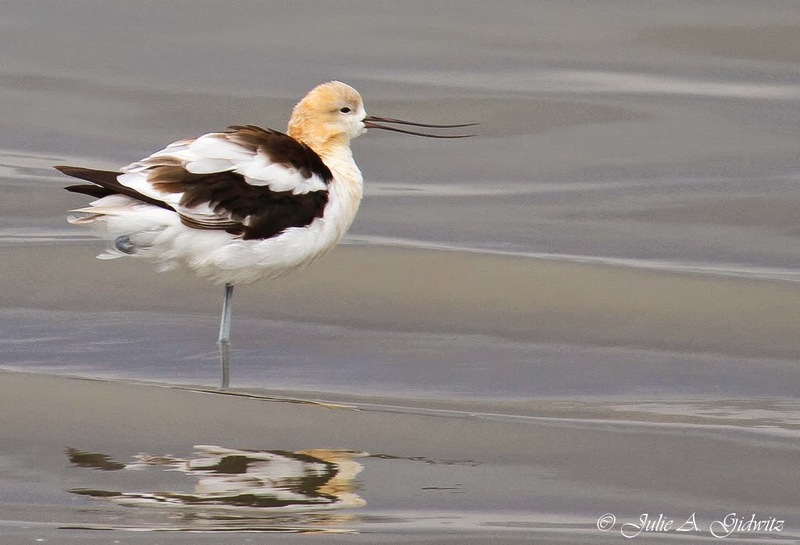 Here are a few photos of some of the shorebirds I have seen in my travels across the United States. Click on the links below for more info or to visit my blog. Sign posted at Reid State park to protect critical nesting sites. The Least Bittern is a bird that is certainly a regular inhabitant of the ubiquitous marshes that dot the prairie landscape of where I live in west-central Minnesota. Yet I had never seen one. This is due to the bird being so secretive and elusive and its habitat being so thick and uninviting that our small contingent of county birders rarely bump into it. Late this summer the army of metro birders in the Twin Cities were flocking to the Wood Lake Nature Center where two very cooperative Least Bitterns were being seen from a boardwalk that cuts right through the middle of the large marsh on the Nature Center's property. Pictures of these birds were spamming up the Facebook page of the Minnesota Birding group. It was a rare opportunity indeed to see such a bird up close and unafraid of pedestrians. Despite this, the two-hour trip was just too far to go for a bird I could probably see someday within just a few miles of home. But as luck would have it, I had to attend a three-day training for work in St. Paul, so I was able to get over to the Wood Lake Nature Center and see this bird for myself. And what a delight it was to get this lifer with unobstructed views from just six feet away! My whole family was with me on this adventure. As a bonus to this lifer, my son got to meet one his field guide author/photographer idols who was watching and photographing this bird right alongside us. Stop over at A Boy Who Cried Heron for the rest of the story. Who's Migrating Now and What's To Come! 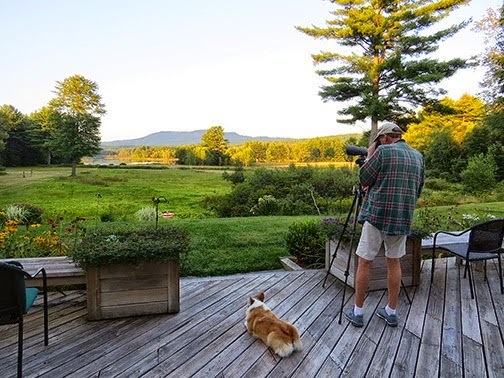 Don and our Corgi, Abby, watching for nighthawks from our deck. 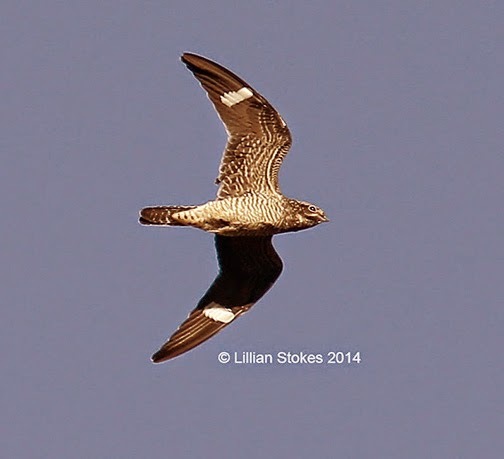 We live in southern New Hampshire and the Common Nighthawk migration through here has been spectacular. We are lucky because nighthawks migrate past our deck since they often follow river corridors and our property fronts on a dammed up section of a river. 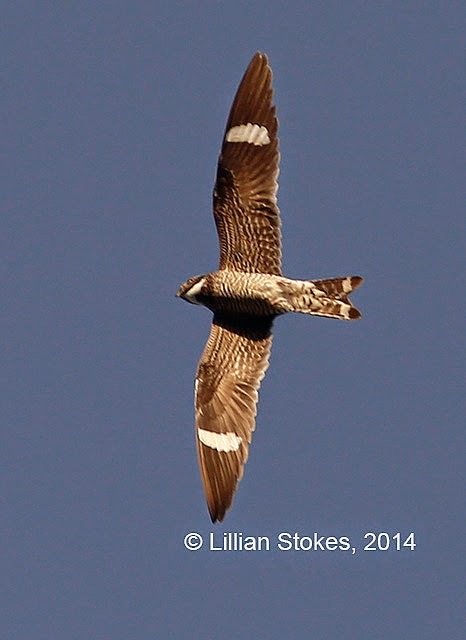 We have seen over 2,000 nighthawks so far. 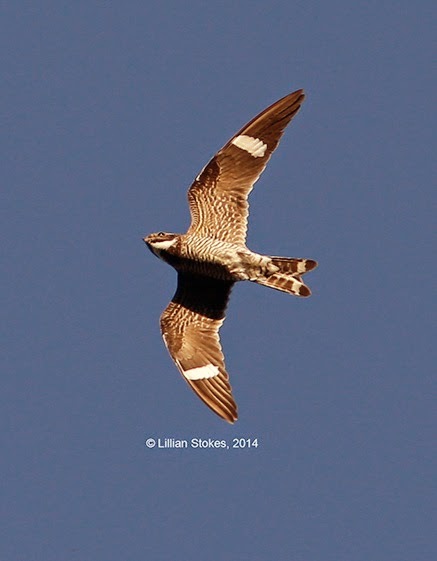 Nighthawks are listed as endangered in our state and their populations nationwide are in decline so it's very rewarding to see them in such numbers here. 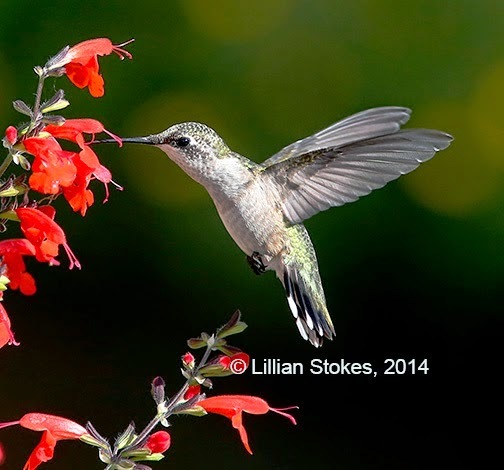 Ruby-throated Hummingbirds and other hummingbirds are migrating now. This is a female who was feeding on our Salvia "Lady in Red" flowers in a planter on our deck. Soon they will be gone from our area. Hate to see them go. Shorebirds are still migrating. Check Coastal and other water areas in your favorite birding locations and see who you can find. 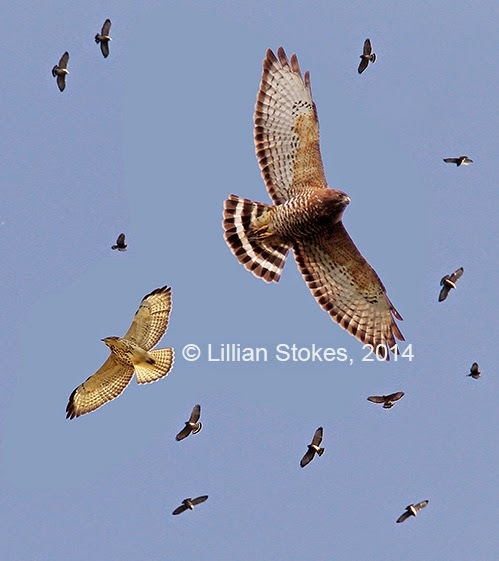 Broad-winged Hawks in a "kettle" (juv. left, adult, right) on a rising thermal of air. Hawk migration is about to happen. This is one of our favorite birding activities and we spend the fall at Pack Monadnock Raptor Migration Observatory in southern NH. The big push of Broad-winged Hawks occurs from about Sept. 10 to 20th in our area. On a favorable day with thermals and mild NW winds we can see thousands in a day. Other raptors such as Cooper's and Sharp-shinned Hawks, Northern Harriers, Merlins, Red-shouldered and Red-tailed Hawks, American Kestrels and eagles will continue migrating through much of the fall. 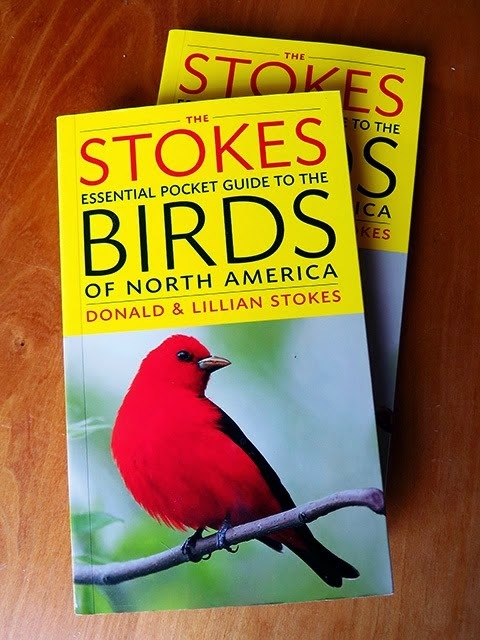 Photo above is from our newest field guide, The Stokes Essential Pocket Guide to the Birds of North America, coming Oct. 14th! This pocket sized guide covers 250 species with beautiful large photos. In a few instances there are composite photos, such as the above one of the Broad-winged Hawks, which I photographed from Pack Monadnock. The book will be great for beginning and intermediate birders, and even non-birders! Happy fall bird migration watching everyone!